The ability to write effectively has always been part of public health practice, whether at a government agency, a university, or a commercial company. At government agencies, workers must communicate well in different genres, such as scholarly articles, official reports, postings on the Internet and social media, and memoranda and emails. At universities, competent writing is at the core of successful scholarly publishing, grant applications, and teaching. In private industry, effective writing is fundamental to commercial success. In recent years, public health schools and government agencies have had increasing concerns about students’ and employees’ ability to write effectively and many schools have established writing instruction programs. 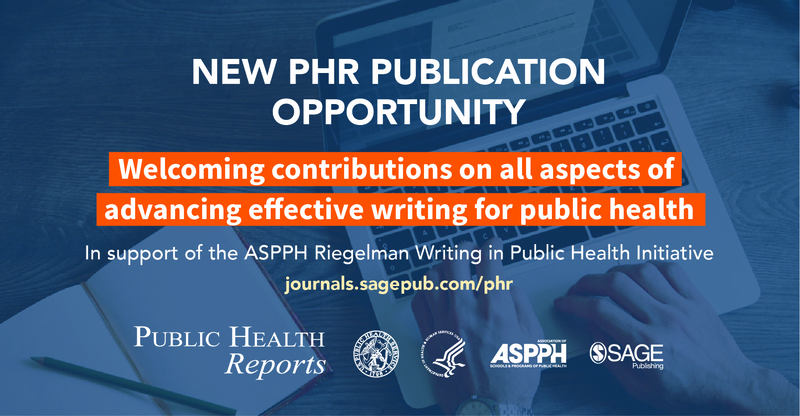 In 2017, ASPPH established the Riegelman Writing in Public Health Initiative at the Association of Schools and Programs of Public Health (ASPPH), a result of the efforts of Dr. Richard K. Riegelman, professor and founding dean of the George Washington University Milken Institute School of Public Health. ASPPH established an advisory committee made up of public health and writing experts to study the issue and consider solutions. As part of this activity, PHR established a new department in the journal called “Writing for Public Health.” This call for papers invites submissions to this new department. Papers are being accepted on a rolling basis. Public Health Reports is the official journal of the Office of the U.S. Surgeon General and the U.S. Public Health Service and has been published since 1878. It is published bimonthly, plus supplement issues, through an official agreement with the Association of Schools and Programs of Public Health. PHR’s mission is to facilitate the movement of science into public health practice and policy to positively affect the health and wellness of the American public. August 30, 2018 "ASPPH Marketing Toolkit Launches" September 6, 2018 "This Is Public Health Graduate School Fairs – Houston, Tampa & Virtually"